Nick Walsh battles a crowd of Berean Academy defenders in the Tigers’ 37-36 loss to the Warriors March 8 at the Class 2A State Tournament in Manhattan. 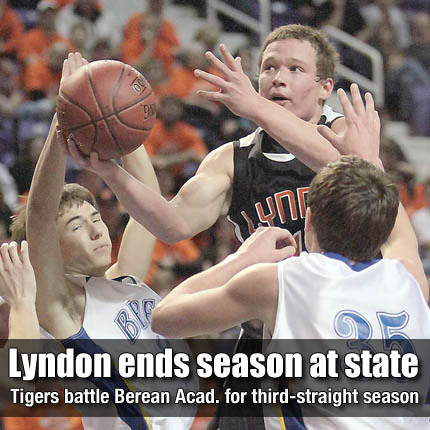 Last week’s loss was the closest of three run ins between Lyndon and Berean Academy at the state level. MANHATTAN—The Lyndon Tigers finished their season with the same team that ended it the last two years. It was a different round than last year, but the outcome was the same. The Tigers battled throughout, trailing Berean Academy by as many as 6 points at the half, but returned to tie the game 31-31 halfway through the fourth quarter. Lyndon and Berean Academy were tied again, 36-36, going into the final 30 seconds of play. A foul defending Berean Academy’s last shot on the other end put Cameron Rust on the line, who sank the second of two shots to give the Warriors their game-winning point.